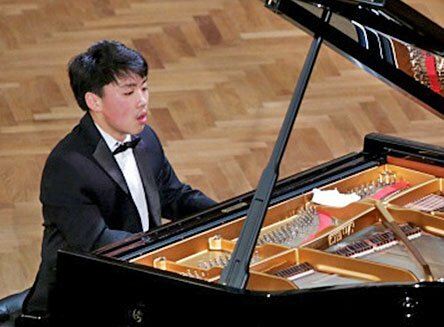 Local pianist George Li, silver medalist from the latest International Tchaikovsky Competition, returned to his high school of Walnut Hill Friday night to play for an eager crowd of friends, teachers, family, and fans as part of the Foundation for Chinese Performing Arts festival. The recital began late as ushers scrambled to find more chairs and seating and eventually lined the aisles. Many young children were cradled in parents’ arms. One watchful little girl inches to my right, in dad’s lap, looked at me every few minutes to question, Why are you writing in a little book? I had to wonder, after the performance and after witnessing the audience’s joyous reaction, what Li might be called were he a screen superhero as opposed to merely the stage hero that he clearly is on his way to becoming. We might call him Piano Voicing Man for his astonishing ability to create and project many-colored lines and melodies while doing battle with the likes of Chopin’s Andante spianato and Grande Polonaise brillante. The emphasis was on brillante, and there wasn’t much of a contest: Li was the easy winner, and not out of breath in the least. But the piano didn’t suffer; no notes were banged all night. Maybe Piano Sound Man as opposed to, say, Boy Wonder, which is already taken? But Li’s conceptions of form and structure, his concentration and ability to hear and then propel a piece from opening note to last, or to toss a piece off as if it’s a gesture, can make him sound more like an old master. Li opened with the Chopin Ballade in G Minor, not with a tentative approach (he knew what he wanted to do) but with almost an achingly excessive amount of rubato. Some of us were wondering what we were in for. By the time we arrived at that gorgeous theme in a major mode—the first of three magical occurrences where, once heard in sequence, we discover the composer has achieved the impossible—Li had exposed beautiful inner voices and established a pulsing flow with dark pedal points that would build and ebb, and climax just so, through to the breakneck, super-intense, violent coda. What drama, what a rich Chopin sound, and what concise bravura! Who’d’ve thought it, though? The G-minor Ballade delivered up a warmup? Because that’s what it seemed like, after the first half of the recital. Not a bad thing at all, really. The F-Sharp Major Impromptu was sweetly rendered, with charm and grace, but also with appropriate use of aristocratic force. That said, Chopin is quite clear in not asking for a tempo change in the chordal section (bar 30) with the introduction of a new idea, though it seems that every artist known slows down to almost a crawl. Li no exception. It would be great to hear this work in tempo, each section. It could potentially yield more artistic cohesion. Then, by the Waltz in A-flat Op. 42, three pieces into the program, we get basically an encore. What a novel concept, and what a delight! Astonishing articulation, with a super-light bouncy dancing over the keys. Breathtaking. And no small clue to what would follow with the Andante spianato and Grande Polonaise brillante. This op. 22 work, so close in the composer’s oeuvre to the op. 23 Ballade heard minutes before, is worlds apart musically, but still so unmistakab-Li Chopin. And an undeniab-Li a showpiece. The prodigy gave us a fun ride and superb display of Chopin’s (early) sonic vocabulary. You have to wonder why Rachmaninoff’s Variations on a Theme of Corelli aren’t performed more often. Maybe because they can sound like the visual equivalent of puddles of brown? So to hear them performed by (shall we call him) Piano Colorist Man is maybe akin to upgrading your TV from black and white low-def to Blu-ray and then watching a good Marvel blockbuster for the first time. This near-static (by simple definition of “variation”) set of pieces is a near-perfect vehicle for Li, who takes that seeming disadvantage and uses it great advantage. Each variation became a neutral canvas for him to reveal what can be displayed, what can be varied. The opening was ultra-projected, a Baroque theme on steroids. In addition to all the color there were more amazing voicing in the first variation, masses of sound to follow, wobbly drunkenness, reaching and questioning, stomping and attacking, (appropriate) jerkiness (perhaps exaggerated by too much leaning and tilting; Li is not always fun to watch at this stage), followed by so much sound variation. In a later variation, waves of sound washed ashore only to be sucked back instantly and submerged. How did he do that? This work has plenty of natural arc, too, and Li’s probing and angry thudding of the final bass notes yielded 10 seconds of silence and respect from the audience. On a meta-level, the performance revealed that Rachmaninoff had exploited the piano’s potential in ways almost as revolutionary as Chopin and Debussy. And that made for the most convincing work on the program, loads more enjoyable and memorable than your average blockbuster. Ravel’s La Valse, the official closer, has so many points of apparent climax that it’s hard not to be worn down by any performance. Li’s advantage, though, is an ability to deepen (and also lighten!) the color spectrum, and his performance seemed just a little lighter, more colorful than most (although at same time immense and powerful), as he waltzed through time, not so much out of time (that is as in harkening back to some bygone era). Nearly four minutes in, there was more relaxed pleasure to be taken in Ravel’s development (and Li’s playing) of the newly developed waltz theme, one that must have influenced the writing of the opening of the Willy Wonka theme for the tune “Pure Imagination” before it goes off on its own wonky tangents). We reveled in hearing more Ravel in the Ravel, the same way we had heard more Rachmaninoff earlier. The seemingly drunken yet totally controlled playing held us pretty much in check as we journeyed beyond (absinthe-infused) chocolates to the dramatic final climax. A relief. And a huge ovation. One that warranted encores, naturally. First Li played the Chopin Nocturne Op. 27 no. 1, in C-Sharp Minor, which encompassed in four minutes a whole lifetime, also with a series of climaxes, but music so distilled, and presented as such, that not a second should be subtracted. It is a deceptively big piece, structurally and musically, and Li made it sing, cry, exalt, and ultimately accept death, having been thrilled with the opportunity to have lived. Credit Chopin as much as Li. Though we heard earlier a Chopin work as late as opus. 42 (the Waltz), this Nocturne, while still an early opus, is mature Chopin, a haunting and most welcome choice. Rachmaninoff’s Etude-Tableaux Op. 36 No. 3 was dispatched with gusto, big sound, and much color. Here, as with the Chopin Waltz, the playing was more like an old master’s, as if the work were an old friend. Li dedicated the final encore, the Liszt Consolation No. 3, in D-flat Major, to a friend whose mother had just died. And once again, we were treated to a sound study of a composer’s style of composition. The voicing in the lefthand gave us a totally different background from the foreground melody, where, when in octaves, each line sang separately. Interesting-Li, this work also is one of Liszt’s tributes to Chopin, and his other op. 27 Nocturne, no. 2. Perhaps surprisingly, Li’s take, albeit beautiful, was introverted, without rapture. I was left wanting a little more. But after not needing any more from the rest of the program, it was just the right ending to a spectacular evening of Romantic piano playing. Bravo, George Li. Beautiful review of a magnificent concert. It’s been a joy and ever so exciting to watch him grow and blossom. Great review of a wonderful recital! Á propos Chopin’s F sharp major Impromptu, so true that nearly “every artist known slows down to almost a crawl” at the bar 30 transition! One bracing exception is Maurizio Pollini, as heard in performance and on his DG recording of Op 33-38. And the author is right: as is so often the case with that pianist, the flowing ‘architecture’ of the piece is magnificently realized. Although the cutesy headline and superhero allusions dilute the weight of this review, all is forgiven because (I think) all of us are having some difficulty comprehending the phenomenon that is George Li. Did Horowitz play this well at this stage of his career?